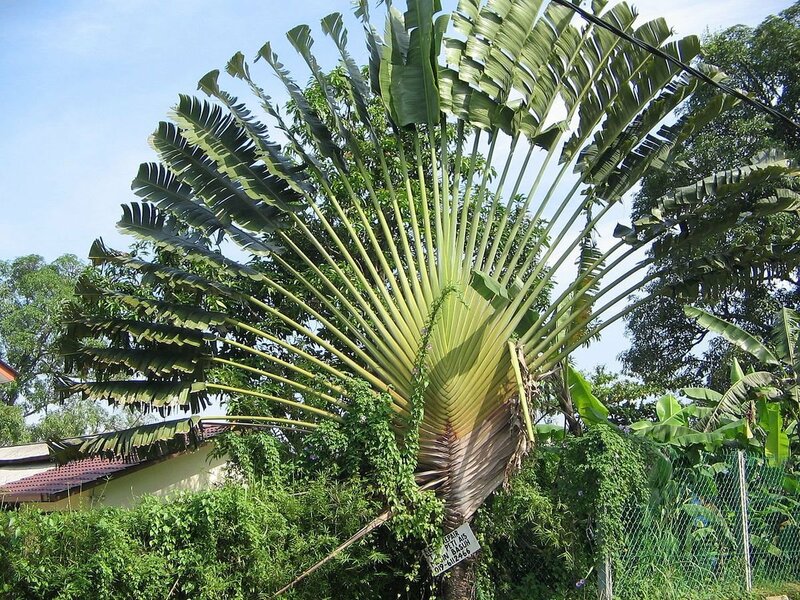 Ravenala is a genus of flowering plants with a single species, Ravenala madagascariensis, commonly known as traveller's tree or traveller's palm, from Madagascar. It is not a true palm (family Arecaceae) but a member of a monocotyledonous flowering plant family, Strelitziaceae. The genus is closely related to the southern African genus Strelitzia and the South American genus Phenakospermum. Some older classifications include these genera in the banana family (Musaceae). Although it is usually considered to be a single species, four different forms have been distinguished. It has been given the name "traveller's palm" because the sheaths of the stems hold rainwater, which supposedly could be used as an emergency drinking supply for needy travellers. However, the water inside the plant is murky, black and smelly and should not be consumed without purification. Another plausible reason for its name is that the fan tends to grow on an east-west line, providing a crude compass. The scientific name Ravenala comes from Malagasy ravinala meaning "forest leaves". Denomination in words is in center. By numerals are in all corners. Denominations in numerals are on right and left sides. 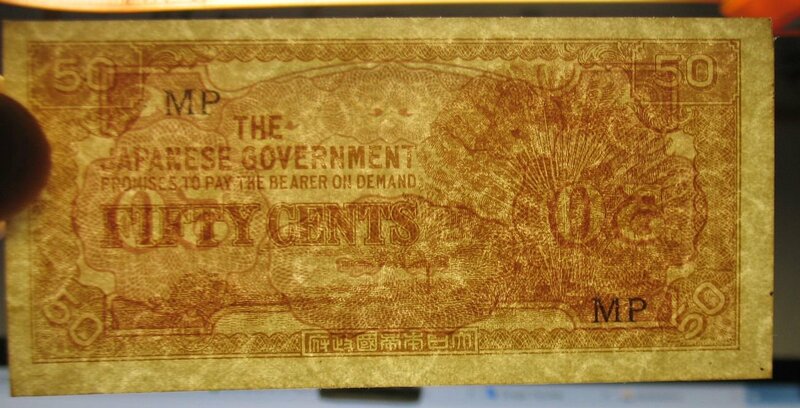 The Japanese government-issued dollar was a form of currency issued for use within the Imperial Japan-occupied territories of Singapore, Malaya, North Borneo, Sarawak and Brunei between 1942 and 1945. The currency was also referred informally (and with more than a trace of contempt) as banana money (Malay: duit pisang), named as such because of the motifs of banana trees on 10 dollar banknotes. The Japanese dollar was in widespread use within the occupied territories where the previous currency became a scarcity. The currency were referred to as "dollars" and "cents" like its predecessors, the Straits dollar, Malayan dollar, Sarawak dollar and British North Borneo dollar. The Japanese dollar was one of several forms of Japanese invasion money issued throughout the then newly expanded Empire of Japan. Similar currencies were issued in Burma (as the Japanese rupee), the Dutch East Indies (as the Japanese gulden/roepiah), the Philippines (as the Japanese peso) and various Melanesian and Polynesian territories (as the Japanese pound). The currency – both dollars and cents – was released solely in the form of banknotes, as metals were considered essential to the war effort. The notes retain certain features that were common among preceding currencies, such as the use of the dollar and cent currency name, albeit without the use of their respective currency symbols ($ and ¢). However, the languages used on the notes were reduced to English, and Japanese at the lower edge of the notes. Each note bears different obverse and reverse designs but retains similar layouts. Intended for circulation in Malaya, Singapore, Brunei, Sarawak and North Borneo, the notes were marked with stamped block letters that begin with "M" for "Malaya".